The controllers we use to play our games consoles currently take on a variety of forms. There's the good old-fashioned handheld controller that comes bundled with our PlayStation or Xbox, those that focus on motion like the Wii remote or PlayStation Move, and even those that sit in front of your TV picking up your body movements while your prance about in front of them. Surely, then, the ways in which we can interact with our consoles are pretty much all covered? No. Not according to Sony, who has just patented an interactive toy for its PlayStation. 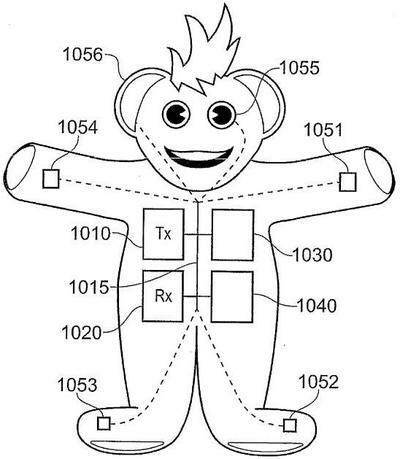 The patent has been revealed by the U.S. Patent Office and describes an interactive doll that sounds similar to Microsoft's ActiMate toy — which took the form of Barney the Dinosaur — from way back in 1997. In fact, Sony actually mentions Microsoft's earlier project a number of times in its patent application. Where a toy is not licensed to interact fully with a media disk, the PS3 can issue generic interaction instructions that follow the spirit of the interactive content on the disk, allowing the toy for example to give generic positive and negative comments as appropriate. This avoids frustration by the user, who as a child is likely to be unaware of and unconcerned by licensing issues. Thus alternatively or in addition, rather than sending a specific instruction to perform a specific action, the PS3 could send a more abstract instruction such as 'act surprised' that is interpreted by the toy according to the resources it has available – for example, the ability to throw up its arms, or to select an appropriate phrase from a built in vocabulary. Okay, an interactive doll that moves — that doesn't sound weird, does it? But wait! It may also cry, with "a refillable liquid reservoir and a liquid release means (for example to generate tears)." Yeah, now that does sound pretty weird. However, I think the PlayStation doll's a great idea (apart from the tears). I have a 4-year-old daughter who would be absolutely mesmerized by something like this, and I think Microsoft may be kicking themselves for not pursuing the ActiMate idea when this thing takes off.